Thanks for joining in our challenge this month. We had fun looking at all the fabulous entries! We used random.org to choose the winner. ValeryAnne please email me at sberkley51 at gmail dot com to claim your prize. Check back tomorrow for our new monthly challenge and another chance to win! Happy Friday! Yahoo, we've made it to the best day of the week!! 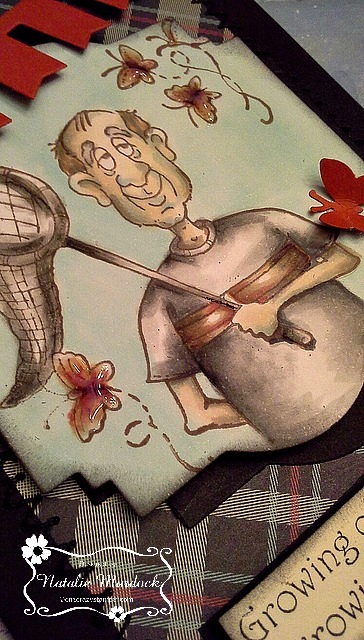 Butterfly Guy is from High Hopes and can be found here! Growing Old Sentiment can be found here! Join us for our February Challenge "Anything Goes"! 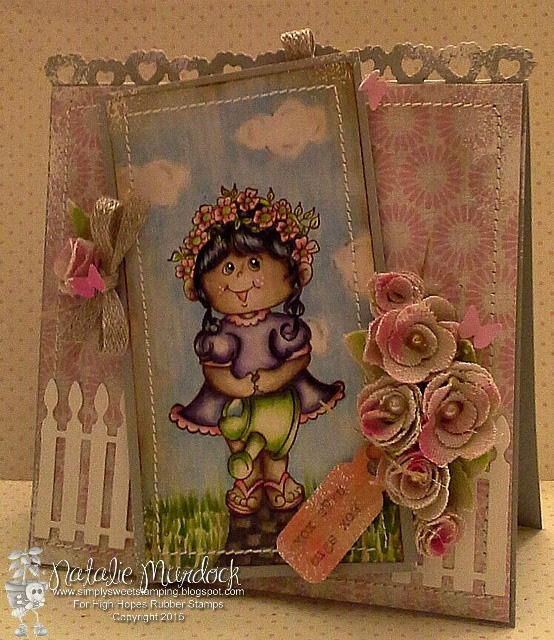 Head on over to the OCS blog for more details and to link up your creations! Thanks for Peeking! 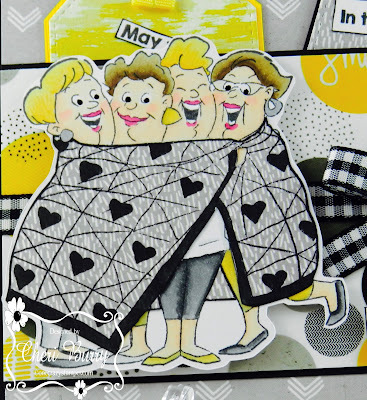 Today I am sharing a stamp from High Hopes called "Brutus". For me, there is nothing like coming home after a tough day to the smiling face of my dog - I mean who else is that happy to see you every day!? I coloured my stamp with alcohol markers and fussy cut it. Pop dots were added to add some dimension. The sentiment is printed from my computer and mounted on brown card stock. 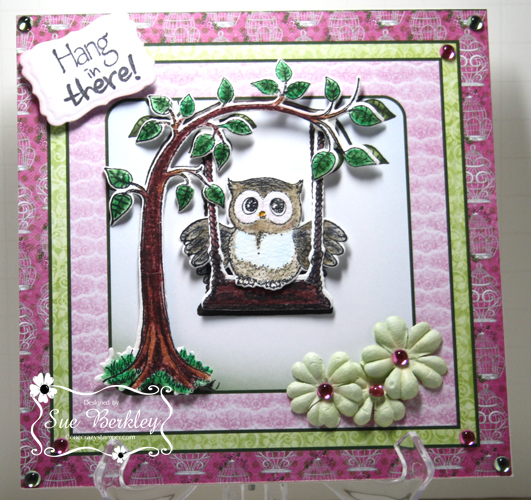 Glossy accents were added to the tag and the frame is from Spellbinders. I used some fun papers from the Bo Bunny Happy Tails collection, some photo tabs from my stash and finished off my card with a few gumdrops. This month's challenge is Anything Goes. You still have a couple days to come play along. Follow this link to come and add your projects. We can't wait to see what you create. Thanks for stopping by! Have a fantastic day! I wanted to share with you a card I made using the Stamping Bella Uptown Girl "Chandler Makes A Choice". 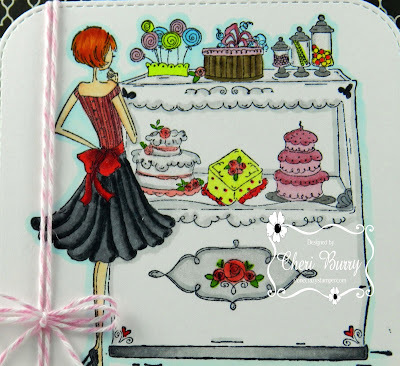 I love the Uptown Girl line and this stamp is "sweet" in more ways than one LOL! Oh the choices Chandler has to make! If it was me I'd say "I'll take one of everything!! 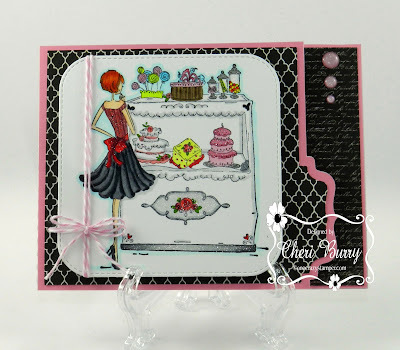 This card base is made with my Silhouette Cameo which made it very easy to put it together! I coloured the image with my Copic Markers and then added a touch of Clear Glitter wink of Stella pen to various parts on all the treats. A bit of Doodlebug Twine and some YNS enamel dots finished everything off! 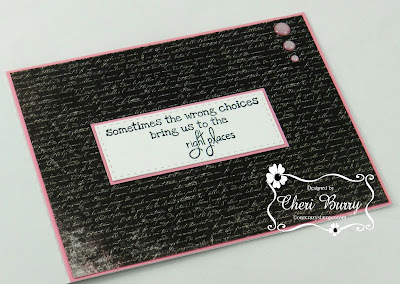 This sentiment comes with the stamp set. Don't forget to play along with us in our February Challenge called "Anything Goes"! 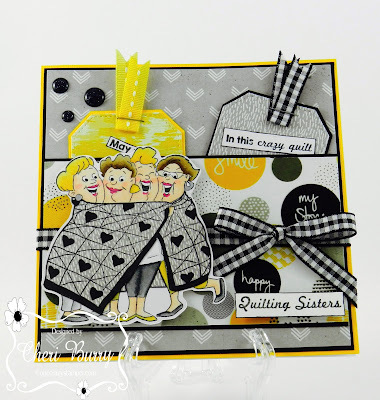 Head on over to the OCS blog for all the details and to link up your creations! Good luck, and have fun being creative! February is almost over, but there is an extra day making it a Leap Year. For my post today, I have used another stamp from the Sugar Hollow Collection by Heartfelt Creations. This whole collection is really fun to play with. There is still time to enter this month's challenge, "Anything Goes". Next Tuesday, we will have a new challenge, as it will be March 1st. Do check out Lora's OCS store for all the new products that are arriving daily as well as all the preorders that are available. 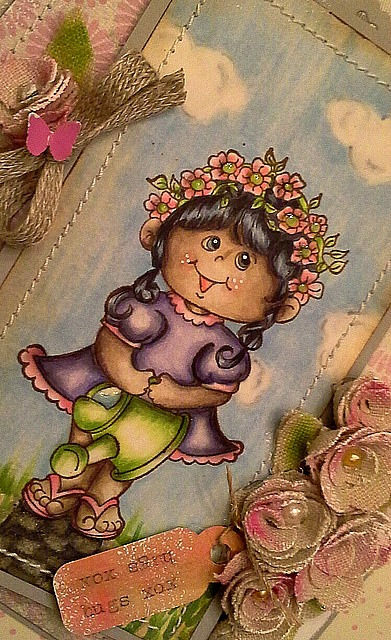 I used Distress Ink, Water, Water Color Paper, Versafine Ink, Stamps, Non-Stick Craft Mat, Water Pen/Brush. I took my small ink squares and wiped them across my craft mat in a random order, and then spritz water over top of the ink. Took my Water Color Paper and smooshed it into the ink, and carefully lifted off and let it dry. In this second one I did it the same, however I used my water pen/brush before it dried and swiped over the ink random like to make more color on the bottom. The first one I added some grass, flower, and bird stamps, along with a sentiment, tried to keep it clean and simple so you can see the back ground better. This last card, I added a bit more stamps, but you can still see the how the ink soaked into the paper and makes a unique background. I hope you liked my tutorial and I hope can try making your own backgrounds, water, ink, water color paper. Happy Crafting. 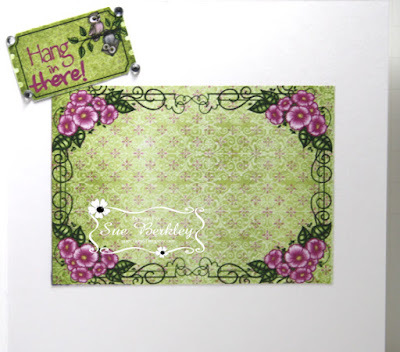 Water Color Paper, Water Bottle, Versafine Ink, Distressing Ink, Water Pen/Brush, Stamps, Non-Stick Craft Mat, Card Stock Base. Happy Friday! Another week gone by , where does the time go? I would like to share my "Wishing for Spring" card. Yep, its that time of year when really really really ... really really want Spring to arrive. Part Time Gardener from High Hopes can be found here! I coloured up this gal with Copics and created some wee little clouds for the background, pathway along with some fresh green lawn details. Lots of sewing stitches, butterflies. and hand rolled flowers that were die cut in a canvas cloth. One last detail was airbrushing with a hot pink Copic marker! Wishing you a fantastic Weekend! Welcome back OCS fans! It's Thursday and my turn to post some inspiration for you. It's also one day closer to Fri-YAY!! Today I am sharing a stamp from High Hopes called Taking A Break. I think this cow would bring a smile to anyone's face! 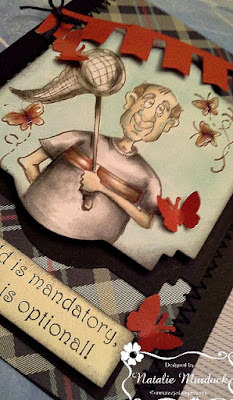 There are some times when someone has done something overly kind or when someone has reached a milestone in their lives that it is nice to send a card to acknowledge it which is where the theme for this card came from. I coloured my stamp with alchohol markers and fussy cut it. I created my scene by cutting some green hills, blue sky and some fence. I added some pop dots to the cow and put my scene together. I edged all of the paper pieces and card edge with Memento London Fog ink. The sentiment was created on my computer. 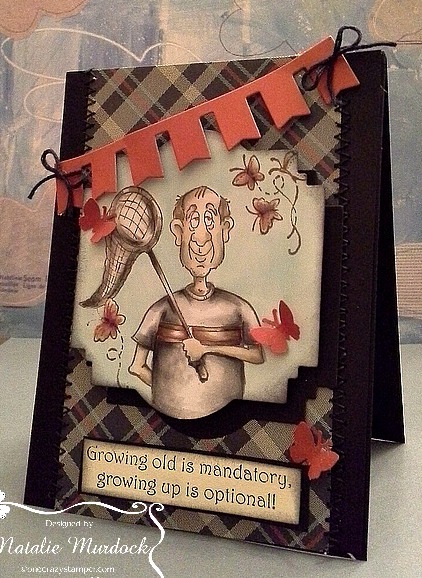 Some twine and black gumdrops finish off my card. It's a new month which means a new challenge here at OCS. 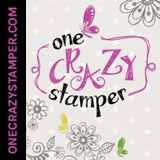 February's challenge is Anything Goes, (except digital stamps). 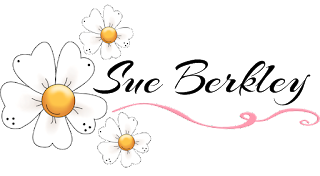 Follow this link to come and add your projects. We can't wait to see what you create. 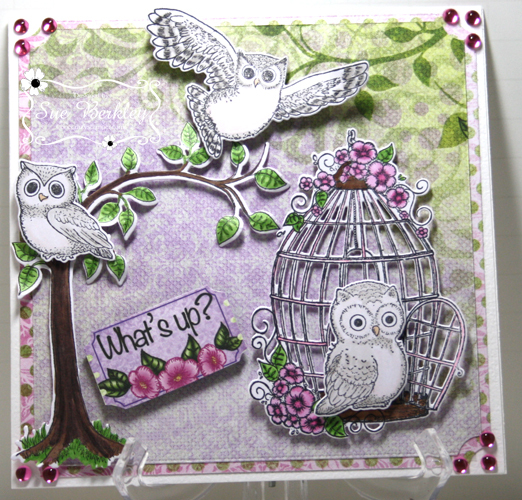 Today I wanted to share with you a card I made using a stamps set from Art Impressions Girlfriends line called "Quilt Set"! This is another favourite of mine! I just love how the Girlfriends are all wrapped in the quilt! They are surrounded by love and friendship! 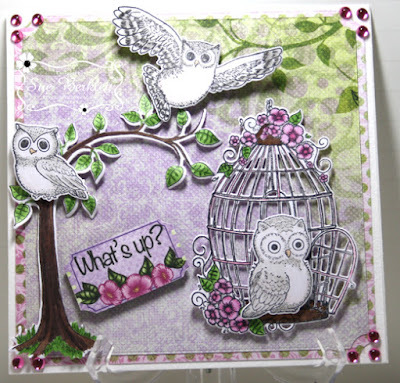 I am using paper from the Kaiserkraft Shine Bright 6x6 collection. I decided to paper piece the quilt and then I coloured in the hearts and the blanket age with my Copic N9. A few YNS Gumdrops and some ribbon with a bow finished things off! I stamped the sentiments that came with the set and then cut them apart and adhered them to these cute tags! I hope you all enjoyed your time off yesterday with your family. It was Family Day, and at least the weather was a little bit warmer than it has been. 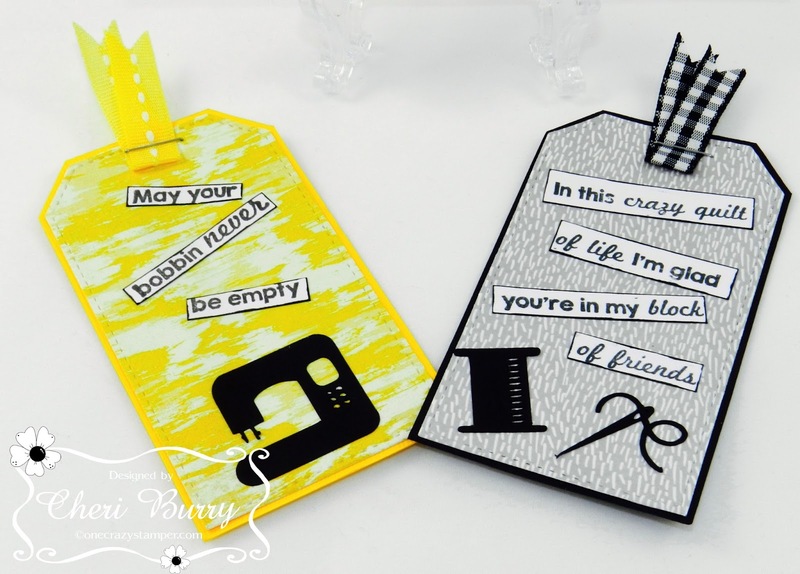 For today's post, I have used the Sugar Hollow Hangout stamp set as well as the matching paper from Heartfelt Creations. This is sure a fun set to use. I used matching paper for the inside of the card. There is still plenty of time to enter this month's challenge, "Anything Goes" for a chance to win a prize. For any supplies check out Lora's OCS store and while you are there, take a look at all the preorders that are available. Until next time, keep crafting and enjoy your creativity. Welcome OCS Fans to our 1st Blog post of 2018!!! Sending you sunshine! High Hopes Stamps!